As conventioneers pack up their model turbines and fly home from the 2013 Windpower exhibition at McCormick Place, they have the wind at their backs. That’s because the nation’s largest convention center announced this week it would purchase renewable energy certificates (RECs) to offset 100 percent of its energy use with wind power. The three-year arrangement with Atlanta-based Sterling Planet will procure credits worth some 331,000 metric tons of carbon dioxide emissions, according to McCormick Place, or about as much as 69,000 passenger vehicles each year. 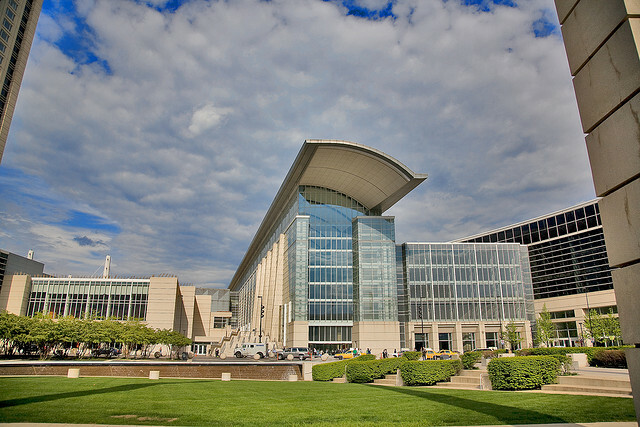 The cavernous conference center uses about 130 million kilowatt-hours of electricity annually, but its plan to buy RECs doesn’t mean wind turbines will now be wired to McCormick Place. As with electricity aggregation deals that scored 100 percent renewable energy for Evanston and Oak Park, the credits can come from established wind farms anywhere in the country. When renewable energy power plants generate power, they rack up credits that they can sell on the open market. According to Ryan Thorpe, director of facility operations for McCormick Place operator Metropolitan Pier and Exposition Authority, the wind power credits came “at little or no additional cost” than their previous power arrangement. McCormick’s move is not the first example of a large purchaser getting bullish on renewable energy. Walmart set a goal to become powered by 100 percent renewable energy, pushing distributed generation and long-term contracts to buy actual energy, not just credits. Google, too, has made major purchases. But a company buys power in a different way than a municipality. The REC deal also comes as McCormick Place tries to cut its energy and waste costs in a bid to brand itself as the nation’s “green” conference venue. In April it won recognition as an environmentally sustainable conference center from the American Society for Testing and Materials, using a new certification process introduced last year. Its West Building also earned the U.S. Green Building Council’s LEED Certification. Laudable though those initiatives may be, the idea of a green conference might seem an oxymoron — no matter how light their footprint inside the exhibition hall, guests still fly long distances to be there. The value of face-to-face interaction, though, is tough to deny and harder to quantify. Whatever the waste involved with traveling en masse for conferences may be, it amounts not to an indictment of conferences themselves, but instead makes clear how fossil fuel use is embedded in nearly every aspect of modern life.